Hugh Garry: How are you creative? 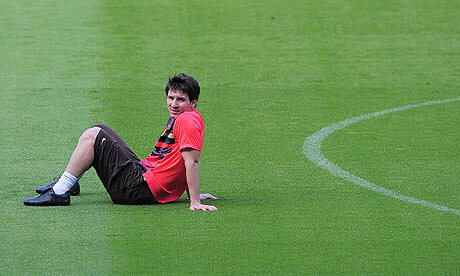 With a ball at his feet Lionel Messi is one of the most intelligent men on the planet. Sadly for him hat-tricks are not included in the narrow range of subjects that count in IQ tests. We all have varying levels of intelligence but our school’s radar isn’t great at picking up the full frequency of talents each individual has. If they asked the question ‘How are you intelligent?’ teachers would be better equipped to engage their students in a meaningful education. It would also give the student a reason to question themselves as to where their intelligence lies. The same thinking can be applied to creativity. We are all creative in different ways. If you think you are not then you can thank your education for that. We are all born creative. As children we think freely, rarely questioning our view of the world. In play we create fantasies without barriers of ‘reality’. We imagine the unimaginable. With colours in our hands we crayon or paint without concern for logic or perspective: if the dragon lives in the tree house with a marshmallow roof then who is going to Question it? We then get a little older and pens and rulers replace the pencils and crayons. The colours turn blue and the lines must be straight. You spend less time thinking freely and are introduced to ‘algebra’, ‘logic’ and ‘reason’. We are shunted into sets of ability and in an annual report measured by the letters A to F, which is strange given there are another 20 letters going to waste. A little piece of creativity is knocked out of us with every school year passing. Maths, English and Science are prioritized as the ‘creative’ subjects are relegated or removed from the curriculum by education committees fearful of raising a nation of ballet dancers. Maybe my vision of education is slightly tainted by the fact that I went to a secondary modern school that handed out teaching position based on who wore: Mr. Brown who was ‘flamboyant’ got art and drama, whilst Mr. Kay owned a tracksuit so he became head of PE. What’s sad about school is that at no point is the education process reversed ensuring creativity given back to its rightful owner. Having gone through a process of un-learning creativity we are left to believe that we never had it in the first place repeating the myth that being creative is either something you are or are not. Whilst it’s widely recognized that right brain thinkers are naturally creative and left brain thinkers more organized and methodical, those skills are not exclusive. With a few simple pointers a Right Brainer can master time management quite easily. Similarly, a Left Brain thinker can learn how to be creative. In his brilliant book ‘Whole New Mind’ Daniel Pink argues that the future belongs to the Right Brainers because the tasks traditionally carried out by Left Brainers can be replicated by computers or easily outsourced cheaply to Asia. So what is creativity and how do you reclaim it? Well, that’s something I plan to address in the coming months. There have been some brilliant books on creativity published since James Webb Young wrote the hugely influential ‘A Technique for Producing Ideas’ way back in 1961. The above mentioned ‘The Element’ by Ken Robinson focuses on finding your passion. Keith Sawyer’s ‘Group Genius’ looks at the role of collaboration in the creative process. Steven Johnson’s ‘Where Good Ideas Come From’ retraces the natural history of innovation. Tom Kelly’s ‘The Ten Faces of Innovation’ breaks down the creative process used by IDEO. And Hugh McLeod’s ‘Ignore Everybody’ gives a step-by-step guide to being creative, accompanied by his own superb cartoons. All of these are brilliant and I will no doubt steal huge chunks in my writing. I’d be mad not to. I’m also going to be getting into the brains of some of the brilliant new thinkers who have yet to commit their thoughts on creativity to paper. I’m looking for new perspective, new process and some bold attempts at producing original ideas. If you have any suggestions on who I should be talking to then leave a comment.